The killings sent ripples through the country. 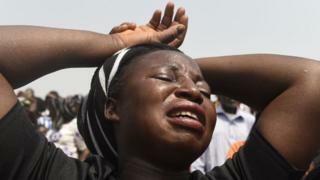 Within hours President Muhammadu Buhari called the attack "vile and satanic", adding that it was an attempt to stoke religious conflict between Christians and Muslims. The Christian Association of Nigeria called for a national day of protest against the killings. The Muslim Rights Concern group condemned the attack, describing it as "wicked, repulsive and barbaric". Back in Mbalom, Mr Nyamgba is adamant that the killers were herders from the Fulani ethnic group. He says he heard them speak Fulani as a he ran away. Beyond their ethnicity, he was less able to tell me why he thought they were herders. The Fulanis played a key role in 19th Century revival of Islam in Nigeria. "Now the killing is almost getting out of hand, despite the government bringing their security personnel"
"People come occupy and start building mosques. They know these are indigenous Christian communities, but they come here, they send people away, they stay there and then they start practicing their own religion...They burn churches, they kill priests." During the harvest period, pastoralists would help farmers harvest crops. Farmers would then allow the pastoralists' cattle to graze on the remaining stalks. He says they would also lend each other money. The relationship has deteriorated for a number of reasons, including an increase in Nigeria's population and improvements in farming techniques. This has enabled farmers to grow their crops more efficiently and left less space on farms for grazing routes, he says. Mr Okpe also blames the recent wave of violence on a new anti-grazing law, which has made herders vulnerable to attacks by farmers who now feel justified in driving them off their land, sometimes violently. "Before the law we used to have some minor attacks, killings but not as many as now. Now the killing is almost getting out of hand, despite the government bringing their security personnel," he says. "The [state] government should remove the anti-grazing law because we're also Nigerians and Benue is where we were born and brought up"
The pastoralists say their animals are dying and they're the ones being driven out of Benue. "The [state] government should remove the anti-grazing law because we're also Nigerians and Benue is where we were born and brought up." It is hard to see how he'll be able to go home.